Supply Missions have returned to Zombies, Run! – Zombies, Run! Supply Missions have returned to Zombies, Run! With Zombies, Run! Season Two almost complete, we’ve had the time to delve back in and reintroduce a much-requested feature into the game. 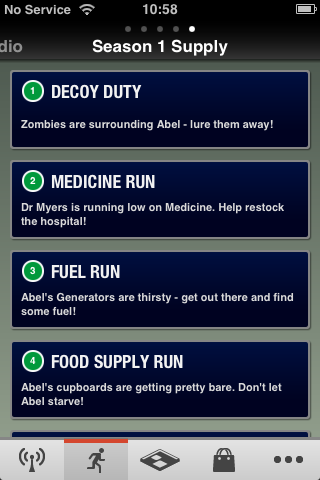 Supply Missions are now available to download for FREE in the latest version of Zombies, Run! Run out of missions, but still need a few more supplies to build your dream Abel? These Supply Missions are replayable runs, during which the residents of Abel will request specific items. It’s a fascinating window into the personalities of each of your Abel colleagues. 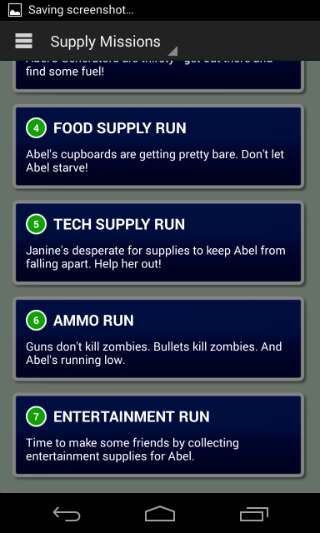 Supply Missions take place during the story of Zombies, Run! Season One and, as such, will spit out supplies only. It’s not possible to earn materials by playing them. Check out the screenshots below to see the Supply Missions in action. 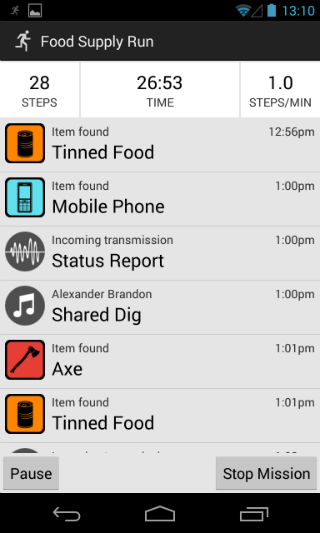 In order to get hold of them, just update your app and download them individually from the Zombies, Run! mission list. Also, we’ve extended the Zombies, Run! sale for a little while longer due to incredible demand.